The primary benefit is to gain the rubber cush drive that is integrated into the 850 T rear wheel. The purpose of the cush drive is to cushion, or soften, the forces on the drive line. The net benefit is greatly reduced spline wear...especially on the crown wheel carrier and the rear wheel splines. A secondary benefit is increased braking power. Although the overall braking surface area is reduced, the 850 T employs a two leading shoe rear brake whereas the stock rear brake has one leading shoe and one trailing shoe. Additionally, there is a leverage advantage due to the longer actuation arm on the 850 T brake plate. 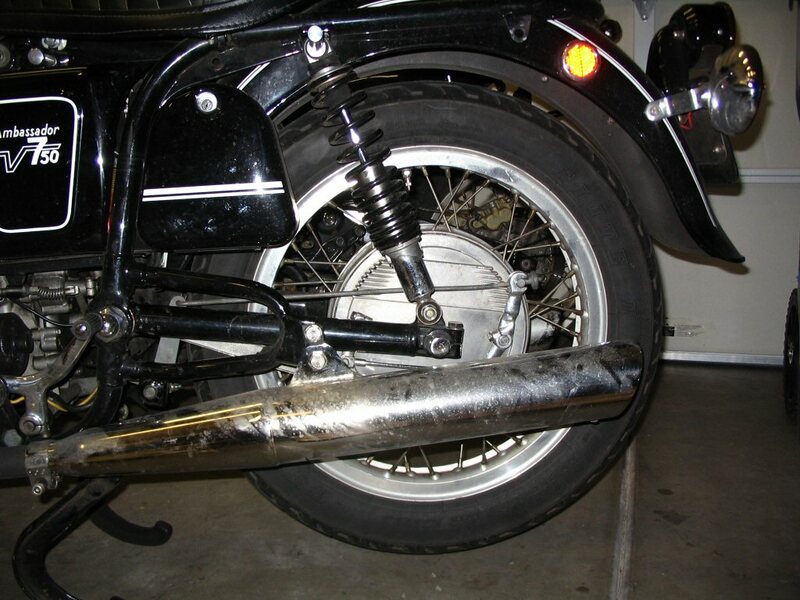 Note: the absence of a trailing shoe brake can be problematic when trying to prevent the motorcycle from rolling backward on steeper hills. Although this is not a concern for disc brake models, drum brake owners should weigh the pros and cons. 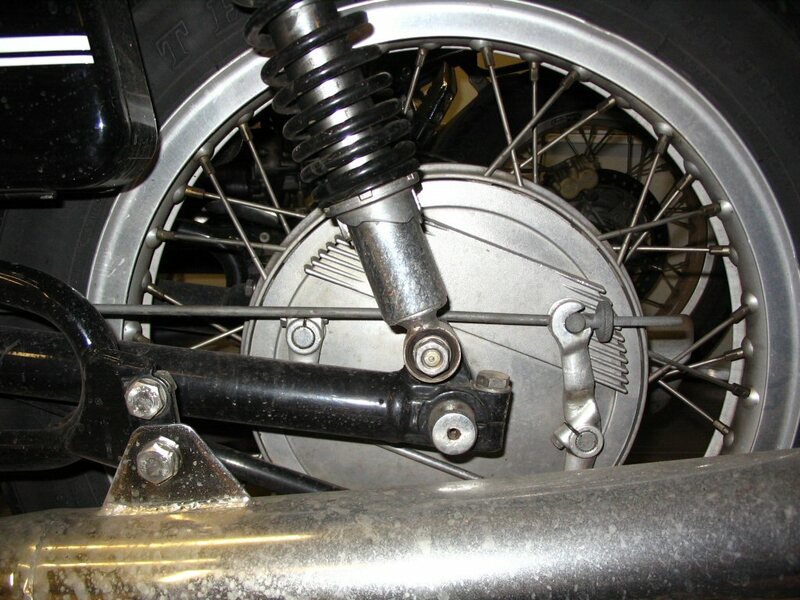 A tertiary benefit - if you have a four leading shoe front brake - is that the overall design of the rear brake plate will match the front brake plates. Note: The 850 T rear brake plate will not sit parallel to the swing arm and will appear cockeyed. Inspect the bearings, pack with grease if they are acceptable. If not, replace with sealed bearings. Replace the seals unless you have switched to sealed bearings. Clean and lubricate the brake plate pivot points. 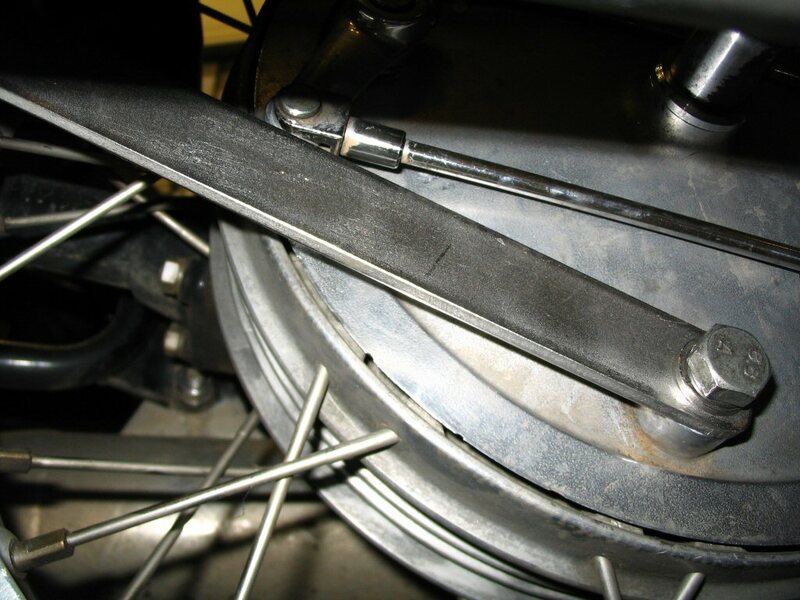 Inspect and replace the brake shoes as necessary. Unless the shoes show a lot of wear, I'd hold off with replacing them until after you try them out. You may want to replace the cush drive rubbers...but I'm doubtful that you'll see much benefit by doing so. I'd leave them alone unless they were obviously deteriorating. It is a good idea to replace the two springs that pull the shoes together. However, these springs are not easy to find. So certainly do not throw away your originals - ever. Thanks to Ron Komoroski for sharing his own solution for helping out his aged springs (see photo below). Clean and polish the rim and brake plate as desired. Added spring to help return the rear brake to the non-applied position after braking. I did not find this necessary on my 850 T rear brake. Photo courtesy of Ron Komoroski. I've never liked that the cush drive does not sit parallel with the the rear swing arm. It always looks a bit off to me. So, I decided to fabricate my own brake stay rod to correct this annoyance. I chose 3⁄16 inch thick, 1 inch wide 304 stainless steel bar. This is plenty stout for the task at hand and the stainless requires no additional finish. The overall length of the bar is 380 mm. The center-to-center distance between the holes is 357 mm. The holes are drilled to fit 10 mm fasteners. I rounded off the corners with my bench grinder/hand file/sand paper. I cleaned/polished the surface with the wire wheel on my bench grinder. The original fasteners may be reused. 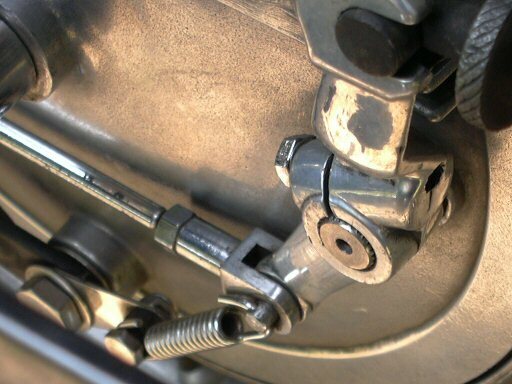 The original brake actuation rod may be reused. Cush drive position with the stock brake stay rod. Cush drive position with the longer brake stay rod. 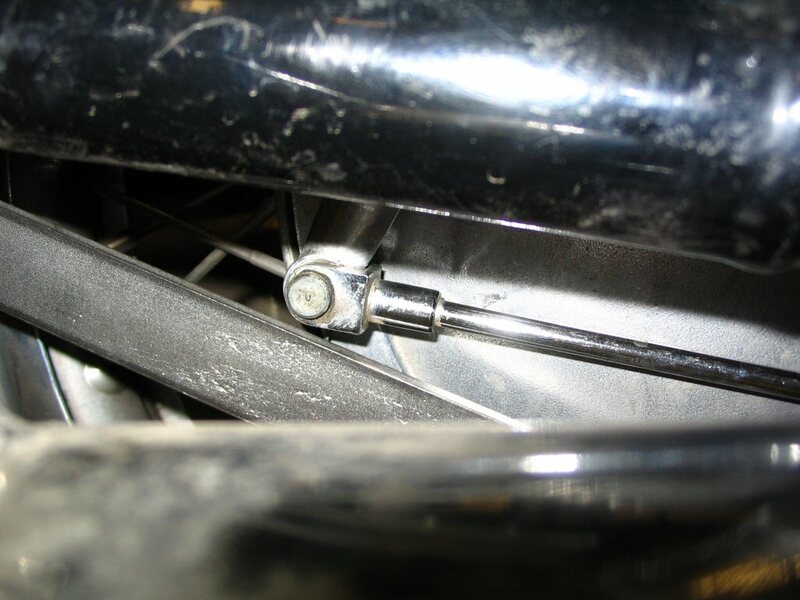 Longer brake stay rod mounted to rear brake plate. Just enough clearance for the front pivot arm.